Week seventy nine and all birthday celebrations had been put to bed so what to choose this week? I delved into Mary Berry’s Baking Bible with less enthusiasm than usual as I felt we were all a bit “caked out” and needed something more savoury this week. 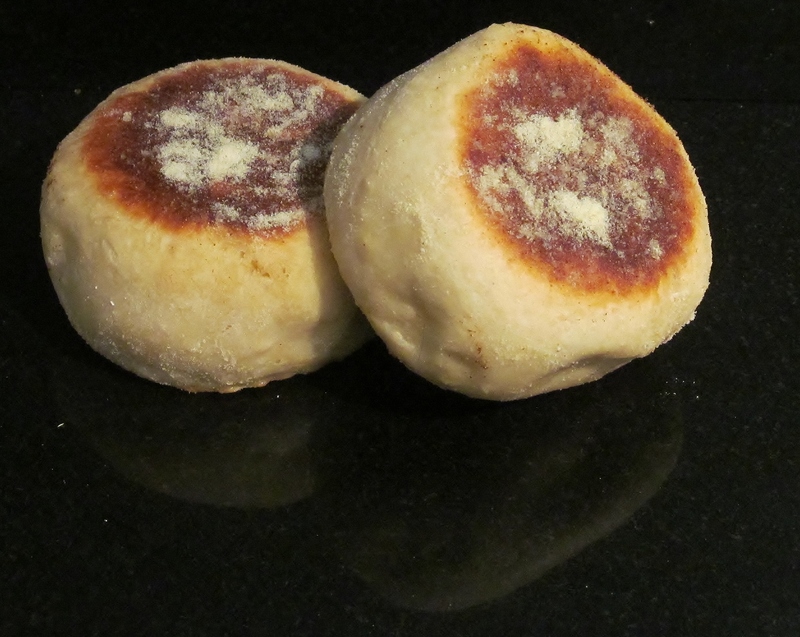 I found the English muffin recipe which I decided to give a go and no, no bread machine in sight this week, these little delights would be made by my own fair hands! I got up fairly early on Saturday and weighed all the dry ingredients into the bowl as per Mary’s instructions. Mary then suggests that you add the tepid milk gradually using a food mixer with dough hooks to help. I was pleased about this as I didn’t think I would have the strength to mix this by hand at the moment. (My recovery is going well but I am not back to full strength just yet). The dough came together nicely and I lightly floured my work top and rolled the dough out and used a 3″ cutter to cut the muffins out. I placed the muffins onto a floured tray, dusted the top with semolina and covered the tray with a large plastic bag. I left the tray on top of my cooker. Mary suggests leaving them for an hour to rise. I used fresh yeast but I ended up leaving mine for about an hour and a half as my kitchen doesn’t seem to be the optimum place for dough rising! Finally Mary suggests you use a griddle or heavy based saucepan- I only had a large saucepan and heat it and place the muffins in it in batches for about 7 minutes each side until they have a nice brown colour and have risen well again. I was gobsmacked at how well they turned out- I , for the first time felt like a “proper” baker this week and I was really chuffed with them. I phoned my official taster who came and collected some still fresh from the oven and between that batch and what we had left over, they didn’t last beyond the end of the day- yum yum! 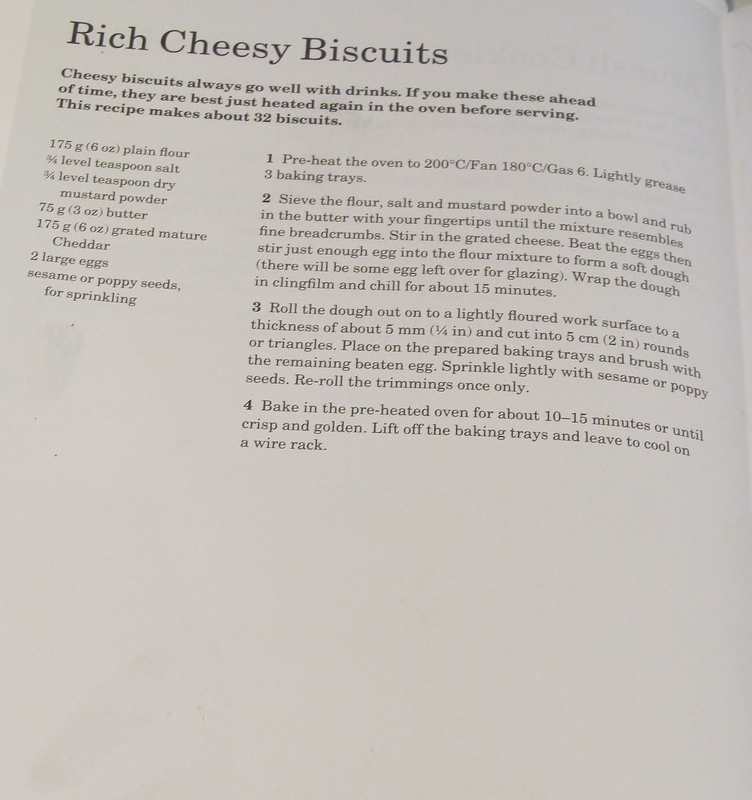 The second recipe was Mary’s rich cheesy biscuits. Mary asks you to put all the dry ingredients in a bowl and then add the butter and rub it in so that the mix resembles breadcrumbs. My other mum recently treated me to the new Lurpack cook range and I used the butter which can be used straight from the fridge and is still soft enough to cook with. It rubbed in beautifully. Mary then asks you to beat the eggs together and add most of the egg to the mix to create a dough and have some left to glaze the biscuits. When the dough has come together, Mary tells you to wrap the dough in cling film and pop it in the fridge for about 15 minutes. Mine was in the fridge a little bit longer as I then popped out to go and pay the ransom demand for my hubby’s birthday card from my mum from the Post Office – (apparently it was 11p extra than the 1st class stamp she put on it but I had to pay £1.11 ransom to get it ! ), then I cam home via the supermarket as I had no poppy seeds or sesame seeds which Mary advises to put on there. Like most of my trips to the supermarket, I couldn’t decide on the topping so bought both…and a few other bits while I was in there! Finally I got home, rolled out the dough and used a round cutter to cut my biscuits. I put them on baking trays and glazed them with the left over egg. 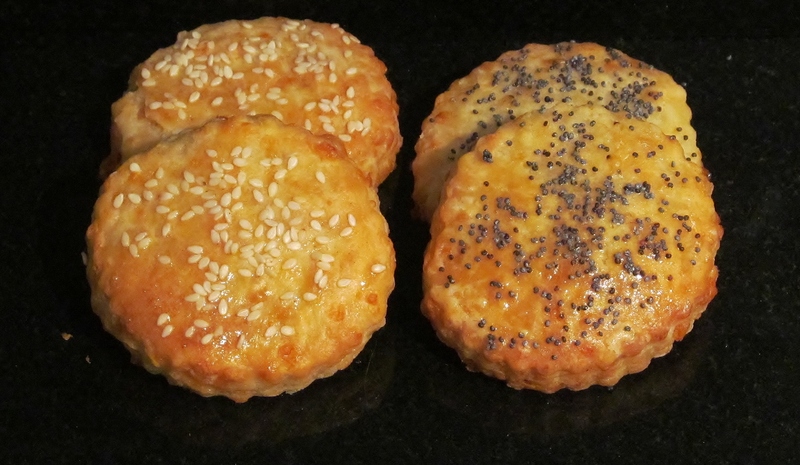 I then sprinkled half of them with poppy seeds and half with sesame seeds. In the oven they went for about 15 minutes. They smelt mouth wateringly good and were beautifully crisp from the oven. they had that biscuit snap noise which both Mary and Paul go on and on about in The Great British Bake Off! Funnily enough, these biscuits were divided between us and the official taster and they didn’t last beyond Sunday- but sadly went a little soft in the tin overnight! 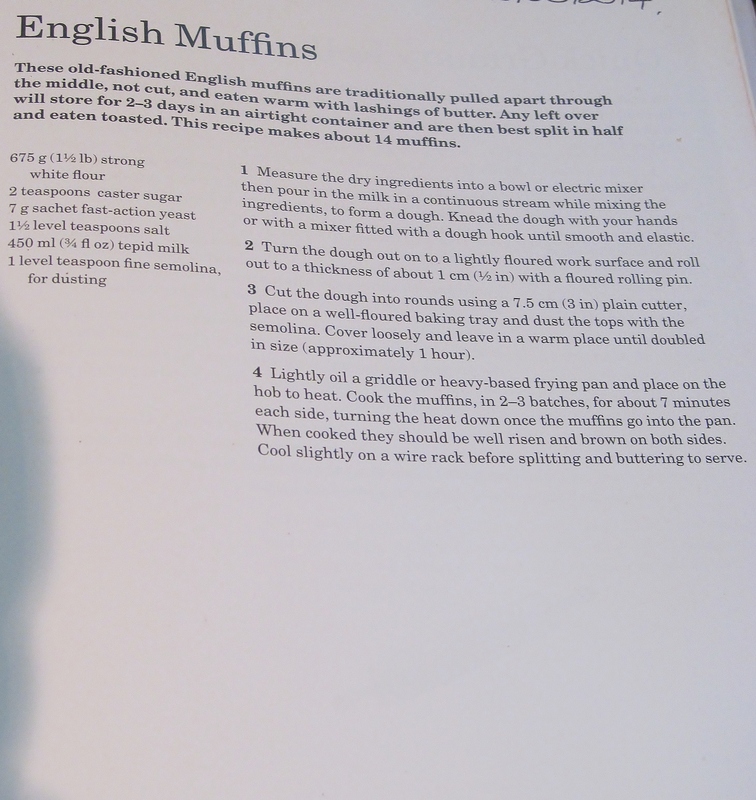 This week I was really pleased with my muffins, I couldn’t believe how well they turned out and I will definitely make these again. I have been a bit nervous of anything yeasty but it has given me confidence to tackle the rest of Mary’s bread recipes without resorting to the bread machine! This entry was posted in Kim's cake challenge and tagged Baking Bible, Butter, cheese, English Muffins, Kim's English Muffins, Kim's Rich Cheesy Biscuits, kims cake challenge, Lurpack Cook Range, Mary Berry, Mary Berry's Baking Bible, Mary Berry's English Muffins, Mary Berry's Rich Cheesy Biscuits, muffins, poppy seeds, Rich Cheesy Biscuits, sesame seeds by kimsideas. Bookmark the permalink. Aww thanks Sam, I was blown away by them, might have been a fluke but more fun to make than they looked. Must correct inaccuracy in your blog. Muffins did NOT last until the end of the day. They lasted for as long as it took me to get the butter and a knife. were they good… Oh Yeees. Thank you baker.